A Facebook post is making rounds online as a passenger insists that the bus should be dropping him off below the fly over on Quezon Ave. but the bus he took has a route that passes above the said fly over. The problem is that this passenger has the guts to even get mad in which he rode a bus that does not go to the route he wished he had taken. He even said that he is a son of a coronel . It is also seen that he even gave a flying kick to the bus conductor and challenged him to a fist fight. Other passengers were heard screaming that the bus conductor should just give his money back just to finish the conversation. 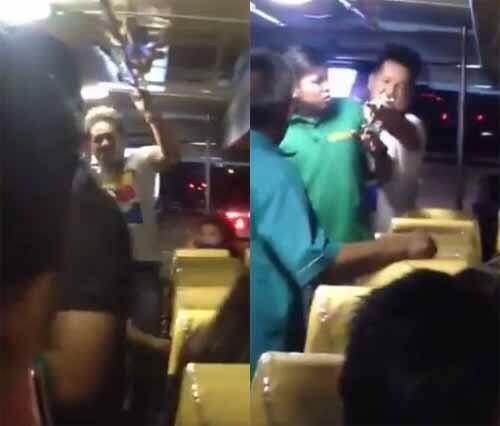 Do you think that this guy have the right to be irate despite him boarding the wrong bus? Also, what do you think of people using names of high officials whenever they are in a situation like this? Share you thoughts by commenting below.